Sub-Saharan Africa is in the grip of a humanitarian crisis, writes foreign affairs correspondent Jonathan Miller, as the worst drought in memory leaves villages empty, fields abandoned and livestock dead. Across a swathe of sub-Saharan Africa, farmers are abandoning their fields. Schools, homes – entire villages – are being emptied. Roadsides are lined by tens of thousands of dead animals, killed by the worst drought in memory. Niger, Mali and Chad – already among the poorest countries in the world – are in the grip of a nutritional and humanitarian emergency. Western aid agencies are united in alarm over what they fear is an impending catastrophe in the Sahel – a semi-arid region that is no stranger to food insecurity and the vagaries of weather-shocks, but where 10 million people are now threatened by acute food shortage. 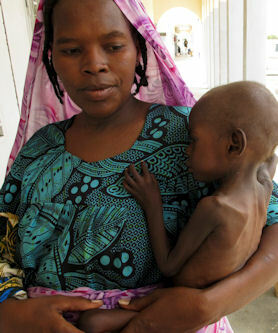 In Niger, half the population of 13 million people are facing hunger: they have no food left. Some I’ve spoken to today have cautiously employed the "f"-word: famine. Not yet... but looming. The message: unless things improve fast, there’s trouble down the road. "I’m in a state of shock, after driving down a track in the bleached-white desert of south central Niger," Caroline Gluck of Oxfam told me over the phone from the capital, Niamey. "It’s quite incredible, the sheer number of dead animals every few metres." Dead livestock: one of the early warning indicators of looming catastrophe. Herders, for whom the cattle represent life-savings, are being forced to sell. But in markets – like the one at Tanout, north of Zinder, the emaciated beasts are going for less than half the price they did a year ago. Images of malnourished children with distended bellies – the sort that for so long have perpetuated stereotypes of Africans as victims – are now virtually guaranteed to revisit our television screens this summer. Medecins Sans Frontieres reports from Niger that nearly half-a-million children under five years old are currently suffering from acute malnutrition. Save the Children says that proportionally, that’s higher than what the World Health Organisation deems a "critical emergency." 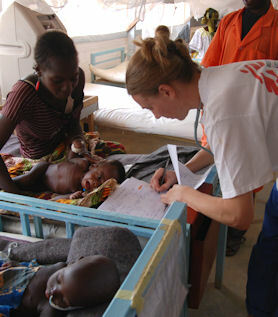 Niger had one of the highest child mortality rates in the world even before this happened. In this part of Africa, it’s a recurring crisis, but a combination of factors: failed rains, failed harvests and soaring food prices, have exacerbated long-term environmental degradation, which some ascribe to climate change and global warming. Whatever’s caused it, weather patterns have changed and an entire region has been tipped into trouble and dependency. "People always struggle during the months they call 'the hunger gap', between harvests," Ms Gluck says. "But around here, they’ve seen nothing on this scale for decades. Everyone I asked said it was the worst they’d ever known." People are resorting to what are known as "famine foods" – leaves and wild berries. The nutritional implications of this cause concern, as do the social ramifications, which are already apparent. Save the Children says that in one village, Kamoun, in south Niger, one in five families have upped and left in search of food and income. They’ve brought their children with them. The headmaster of the local primary school brandishes a list of 35 students who’ve already missed so many classes that they’ll face exclusion in the coming year. Pastoralists – and settled farmers – from the rural areas are drifting into towns. Not just the men, who usually make seasonal migrations for work, but women and children too. These are sometimes epic journeys of up to 1,000km. Journeys made to escape the hunger. "It’s difficult for people to adapt to these changes," Patricia Hoorelbeke, the regional representative for Action Against Hunger, told me over the phone. "But they have to. They have to move and it’s causing pressure on the land. And when they get to the towns, they have no money. It’s a big problem." A farmer from Kamoun told SCF: "It’s not our custom to have our children begging like this. It’s only because the current situation is so bad. 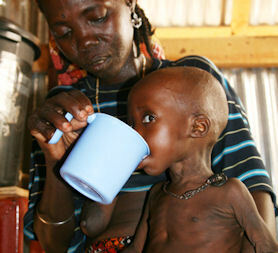 This year, there are whole families – mothers, fathers and all their children, who are out begging for their food." Caroline Gluck from Oxfam found something even more alarming in the town of Tanout in Niger. In the market, a woman called Raya Sa’adou told her: "A lot of women have left their husbands behind in the village and come to the towns. There is nothing for them in the village. They are working as prostitutes in order to buy some food to eat. I know there are many women like that here." In Niger, aid agencies at least have a grasp of the seriousness of the situation. Next door, in western Chad, it’s possible that the situation – at least in pockets – is actually worse. In one region, northeast of the capital N’Djamena, there’s been no rain at all for a very long time. "We just have no clear data there," says Ms Hoorelbeke of Action Against Hunger. "It’s more difficult to analyse, but we’re possibly facing a catastrophic humanitarian situation. Already." In this part of the world, rain is everything. But the wrong sort of rain – too much too fast – or rain at the wrong time can quickly spell disaster in a region already teetering on the brink. If the right sort of rain comes now and planting goes ahead and harvests follow, and if people can be helped through the lean months, another African famine could yet be averted. Agencies are not wrong to raise the red flag now though. But given the increasing fragility and unpredictability of the climate, what’s needed in this hard-to-get-to region is a long-term plan to prevent crises turning into catastrophes…or worse. It was the build-up of exactly these sorts of pressures in Darfur that created a fertile environment for conflict.